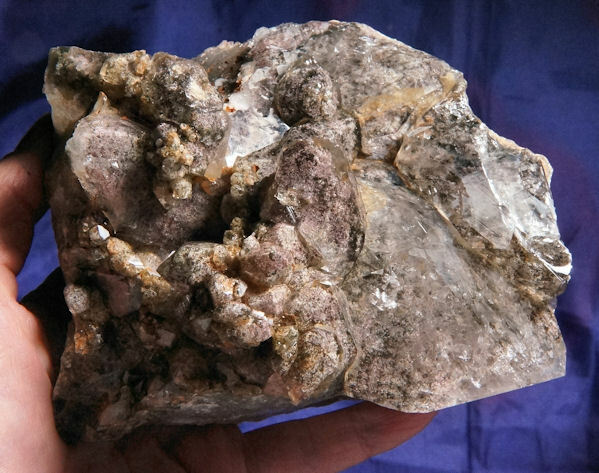 This is a beautiful unpolished garden quartz from Bahia, Brazil ... 2 lb 3.8 oz and 4.6" by 4" by 3" and is really a DT with keys all around. She is most uncommon in that she is very clear, offering a perfect view of the incredible landscape within - use a 10X loupe to see the full beauty of it all and see all the little manifestors within! The landscape is actually a frothy blend of pale gold, shades of mauve, deep ochre, buff and green, creating autumn garden features, all contained in that very clear quartz. Her top is beautiful elestial terminations that enfold the "gardens" within and offer unobstructed viewing while her base is "cloaked" crystals. No matter what, you will delight in working with her as much as you will savor her beauty and grace! She has a few very tiny dings, but nothing that takes away from her message! This Spirit is wonderful for helping her Keeper relate to the Earth, achieving that balance between Spiritual and earthy so as to remind us all that we are to bring our Spiritual advancement into this physical expression. She helps us understand the beauty and peace in a garden and puts us in touch with the incredible energy of all that the Earth holds. And look at her garden within! Do you see crystalline flowers, rolling hills and devic faces peering out at you? These are protector Spirits, revealing themselves to you. And she reminds us that there is a protective aspect to the Earth that we often take for granted. If we allow ourselves to tap into that protection, we can effectively establish a shield that manifests on the Spiritual plane as well and this is critical as we search for higher and higher levels of enlightenment. We are physical beings and all the enlightenment is nice, but unless expressed into the physical and related to our corporeal state, it is useless. She is a Master Crystal beyond any shadow of a doubt!